We recommend that you have done a 200 hour teacher training (any style) but it’s not necessary: let us know if you haven’t and we will look into what other experiences you have. You can also attend the course for your own self inquiry only: no need to put the pressure on yourself to teach if you don’t want to. The intention is to give you, as a teacher, more tools, to broaden your teaching skills as well as your target groups. Perhaps you have done a training in a dynamic yoga style and would like to add a slow style to your teaching menu as well? We have a set structure in line with Yoga Alliance’s criteria, but on top of that we have a certain amount of hours that we can tailor made for YOU – and as far as we know, this is quite unique: for you, as participants, to be able to take part in forming the course content! 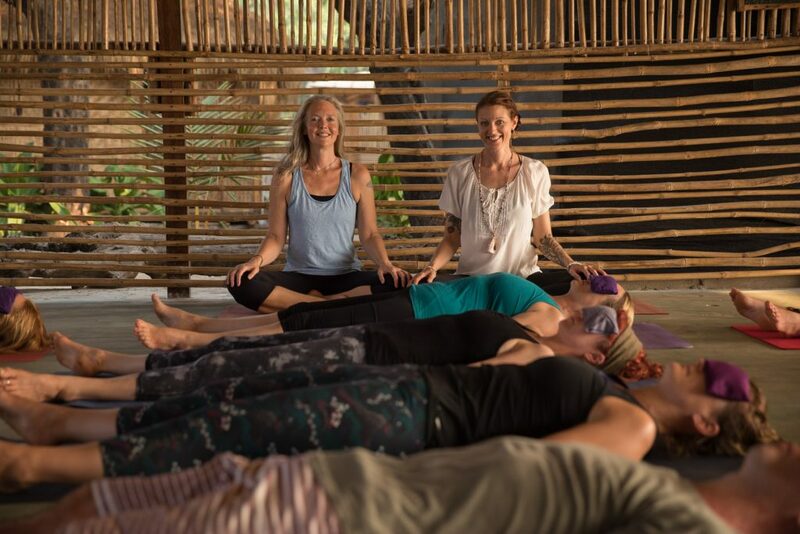 We (Melanie and Jennie) have worked together for almost 10 years (yoga teacher trainings and retreats in India and Europe) and have 20 + 13 years of experience from teaching yoga and teacher trainings full time. We have experienced a lot over the years – and what we keep coming back to is how important it is to be authentic, to find “your voice” as a teacher and to have the courage to be YOURSELF when you are teaching! Working as a yoga teacher is amazing – but it also takes a lot of energy – and can be very draining if you are not looking after yourself. (And it’s so easy to not give ourselves that time/attention/selfcare – so in the training we will also put emphasis on how to create space for your own health and practice: to stay balanced and mentally strong! A non-dogmatic approach. We will cover the main techniques and modern schools of Yoga Nidra and what they offer. You’ll get the chance to compare and explore different methods to see which works the best for you. Yoga Nidra scripts. Online resources: You’ll get ready made scripts in different methods. Together we will also explore and develop a treasure trove of ideas and scripts for teaching your own yoga nidra – as well as incorporating it in your own practice. The structure A detailed look at each stage of the practice; the intention behind it and how it affects the body and mind. If you’re planning on using Yoga Nidra in a way that gives back to the community we would like to support you and offer a schoolarship place at a discounted price. Please write to us if you want to apply for this scholarship, and tell us about your plans. Pre-homework: 10 – 20 hours depending on your previous experience of yoga teacher trainings. Exam: no written tests: you don’t have to “prove” anything: rather: we are interested in seeing that you have gained an understanding and knowledge, that you can apply to each individual student depending on his/her needs. You are not attending the course to perform: you are attending it to learn and to spark your interest in embarking or continuing on this fascinating journey as a yoga teacher! Account details for the deposit will be sent to you after we have accepted your application. Your space is not guaranteed until we have accepted your application and received your deposit. You will receive a confirmation letter from us as soon as your deposit has been received and registered on our account. Upon completion you will receive a level 2 diploma, Yoga Alliance 30 hrs. (Zolder Studio, UK, RYS 300).